Lathkill cottage comprises of two double bedrooms that can be configured with either double or single beds. This cottage is all on one level. The large open-plan living area includes a kitchen with all modern conveniences (dishwasher, oven, hob, microwave), dining area with seating for four and a lounge area also with seating for four. The newly renovated bathroom includes a walk-in shower. The cottage is decorated in muted tones of cream and red. Outside is a private patio area with chairs and a barbeque, overlooking the countryside and duck pond. We have four holiday cottages sleeping up to 20 people. The holiday cottages are set within their own private garden and surround a courtyard. Each cottage is individually styled and all were recently renovated to a high level of comfort with all modern conveniences including wifi. All bedding and towels are provided. Stainsborough Hall is located on the shores of Carsington Water - with direct access to the footpath around the reservoir - in a stunning rural location. The gardens are full of secret passageways, hidden swings, beautiful flowers and even a stream. While the house and outbuildings are full of history and built of beautiful Derbyshire stone. 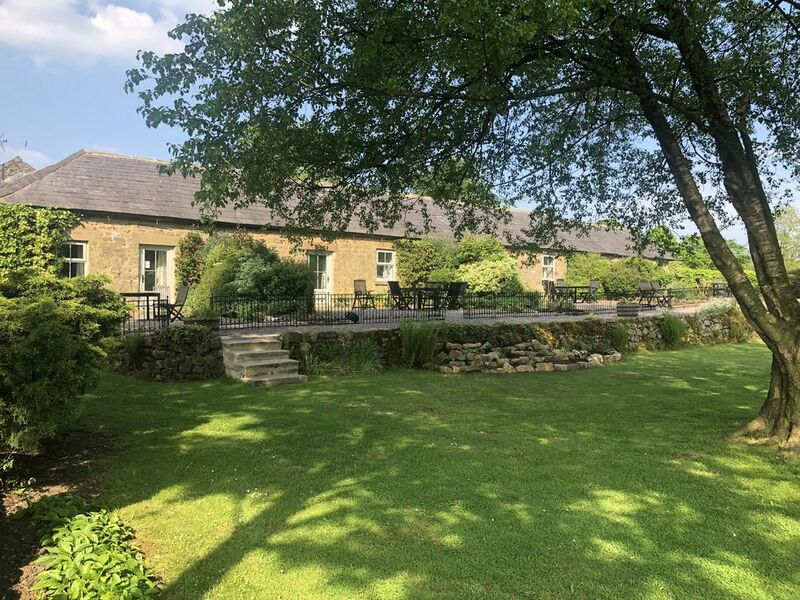 The house is set back from all major roads and surrounded by fields, animals, flowers and Carsington Water - its just the perfect place to relax either for large gatherings of families and friends or for romantic get-aways for two. In addition to the cottages there is a large games room and a private tennis court which guests can use. There are plenty of books, games and dvd's as well. While Stainsborough Hall is in a rural location, it's not too far from anywhere. It takes 10 minutes to get into Ashbourne and Matlock, five minutes to drive to Wirksworth or 20 minutes if you want to walk over the fields. From Stainsborough Hall you can walk directly onto the pathway around Carsington Water using our back gate. So there is no need to walk or cycle on any roads. This is also the quickest route to the nearest pub which is less that one mile away. It is possible to rent the four cottages together, individually or in combinations that suit your party size. Please contact us if you need assistance. Hello - we are Tim, Joanne and Lily. We moved to Stainsborough Hall earlier this year after living abroad for more than 15 years and we're delighted to be home. We are originally from this area and have spent the last few months re-visiting many of the places we loved as children, meeting old friends and making new ones. We've also been dedicated to renovating our cottages to be the kind of place we'd like to go on holiday. We're sure you won't be disappointed. Stainsborough Hall is simply stunning. (if I do say so myself) The gardens are full of secret passageways, hidden swings, beautiful flowers and even a stream. While the house and outbuildings are full of history and built of beautiful Derbyshire stone. The house is set back from all major roads and surrounded by fields, animals, flowers and Carsington Water its just the perfect place to relax. But, at the same time its not too far from anywhere. It takes me 10 minutes to get into Ashbourne and Matlock, five minutes to drive to Wirksworth or 20 minutes if you want to walk over the fields. I couldn't imagine anywhere more beautiful now and we feel incredibly lucky to live here. From Stainsborough Hall you can walk directly onto the pathway around Carsington Water using our back gate. So there is no need to walk or cycle on any roads. This is also the quickest route to the nearest pub which is less that one mile away. The gardens are also a beautiful place to relax and our private tennis court, games room and children's play area give you a lot to do in between going off to visit the hundreds of things to do in the area. The bathroom in Lathkill Cottage includes a large walk-in shower and heated towel rail. We provide high quality, high thread count white linen for all beds. The washing machine is housed in the washing room accessed across the courtyard. The tumble dryer is also house in the washing room. We provide a soft and luxurious bath, hand and face towel for each guest. There is a large games room onsite that houses a table tennis table and other amenities to help you enjoy your holiday. There is also a private tennis court available for guest use. New sSlimline dishwasher has been installed in the kitchen. The kitchen has been newly renovated and consists of all modern conveniences. The cupboards are well stocked with all the crockery and cooking utensils you'll need for a holiday. We have put a large HD freeview TV in the cottage. We have an extensive collection of books to borrow in the games room. Available to borrow from the games room. An extensive collection of more than 500 DVDs are in the games room and available to borrow. We have a lovely private tennis court available for use. I would highly recommend these cottages, very nicely refurbished with lovely decor. My children loved the play area and we enjoyed the tennis court as a family. You can sit outside in the sun all day at the back of the cottages with rolling hills as your view. Great hosts, very good communication and on site should you need anything - great wine available to taste/buy. Overall one of the best self catering breaks we’ve had in england. Love coming here with the family. Thanks again for a great holiday. Lovely base for our family holiday. Thank you Joanne and Tim. We really enjoyed our stay - we chose it because it was close to our friends in Middleton and it was very convenient to visit them. We enjoyed a game of tennis and walking round the grounds but most of our time was spent off the property. The cottage was really clean and the beds comfortable. It was lovely and quiet so we slept very well. I do wish I had brought my slippers as only the bedrooms were carpeted! We had a problem with the bathroom towel rail not working and although this was not fixed during our stay (which made the bathroom chilly) the owners were extremely helpful and communicative over the problem and gave us clean dry towels and I was able to tumble dry them on another day. The kitchen is small but perfectly well equipped for basic cooking and heating meals I had pre-made. It was useful to have the use of a freezer across the yard too. The television reception was intermittent but we made use of the extensive DVD collection in the games room so it didn't matter too much. Thank you for a lovely stay! We loved our stay and will definitely recommend this property to our friends and family. The owners were very friendly and helpful with great local knowledge. Overall a relaxing and enjoyable stay..
We stayed here with anothe couple and we had 2 dogs between us. Cottage was perfect for our weekend stay but would be a little compact for a week with 4 adults but perfect for a couple and a child I'm sure. The lake really is a couple of minutes out the back gate of their land and a pub less than 20 mins walk away around the lake. Would recommend for sure.